Please contact me with any questions, or for pricing and booking information. Or simply submit the form below: If you do not hear from someone from the Rat Pack Team in a timely manner please contact us at the telephone number listed or send a follow up to the email address above. 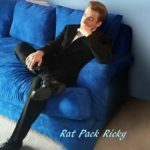 Thank your for your interest in Ricky Medlin Jr.